From playing to paying, vivoactive 3 is the smartwatch for your active life. Make contactless payments with ease, right from your watch, and with more than 15 preloaded sports apps - you can choose how you like to get fit. Built-in GPS lets you record the distance, pace, location and more for your outdoor activities. Vivoactive 3 is our first wearable to feature Garmin Pay, which lets you pay for purchases with your watch. Use it just about anywhere you can tap your card to pay. So, if you left your wallet in your locker or just forgot it, that post-run morning caffe latte can still be yours. Just tap and go. 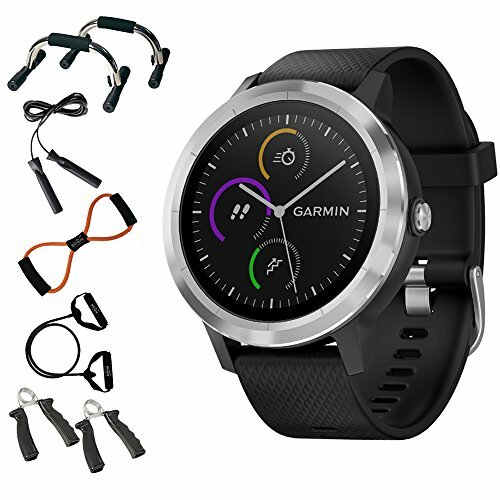 Vivoactive 3 is compatible with our Connect IQ store, where you can download watch faces, widgets and apps that make it go from smartwatch to your watch. Keep tabs on when your Uber is arriving, turn on your lights at home with the SmartThings app, and even use the AccuWeather MinuteCast app to find out when the rain will start. You can also use our free Face It watch face app to add personality to your device that's uniquely you. Just download the app, choose any image from your photo library, make your customizations, and set it as your watchs face. With more than 15 preloaded sports apps, finding a fun way to stay active is easy. Hit the golf course, go for a bike ride, take a yoga class, or even try your hand at stand-up paddle boarding. When you head outside, built-in GPS lets vivoactive 3 track the details of your chosen activity - with no phone connection required. From snowboarding to swimming and at least a dozen other options in between, this watch is the perfect playmate. If you have any questions about this product by Beach Camera, contact us by completing and submitting the form below. If you are looking for a specif part number, please include it with your message.